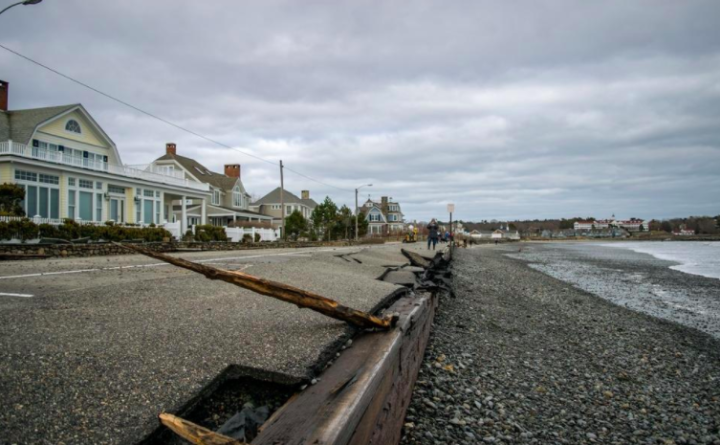 Damage to the seawall along Gooch's Beach in Kennebunk after a nor'easter earlier this month is seen in this York County Coast Star file photo. KENNEBUNK, Maine — Town officials met with officials from the Federal Emergency Management Agency (FEMA) and the Maine Emergency Management Agency (MEMA) Wednesday to survey the damage to the roads and seawall at Kennebunk Beach caused by several recent nor’easter storms. Beach Avenue and several adjoining residential streets saw significant flooding and storm damage during the relentless nor’easter that battered the seacoast during the first weekend in March. The nor’easter coincided with an astronomical high tide, and each high tide cycle brought waves crashing over seawalls, and flood waters flowing over roadways and into low-lying residents and businesses. Repairs will be needed to sidewalks, the seawall and roadways including Beach Avenue, Surf Lane and Boothby Road, Pardue said there was damage to each of the three beaches, Gooch’s, Middle and Mother’s. The sidewalk at Gooch’s Beach has crumbled and dropped several feet. Maine Gov. Paul LePage is expected to seek a disaster declaration for the state which would clear the way for FEMA funds to help towns pay for the costly repairs. Pardue said crews will make temporary repairs, and then apply for FEMA funds to do the permanent work. Meanwhile, Pardue and town officials are hoping for no additional storm damage this spring. “We are extremely vulnerable,” Pardue said.